With a loose, fuller cut for complete comfort, the Under Armour Boy's Youth Tech™ 1/4 Zip features UA Tech™ fabric that is quick-drying, ultra-soft, and has a more natural feel. Anti-odor technology prevents the growth of odor causing microbes so this 1/4 zip is good to go from the game, or the ride to the inside. With a loose, fuller cut for complete comfort, the Under Armour Boy&apos;s Youth Tech™ 1/4 Zip features UA Tech™ fabric that is quick-drying, ultra-soft, and has a more natural feel. Anti-odor technology prevents the growth of odor causing microbes so this 1/4 zip is good to go from the game, or the ride to the inside. 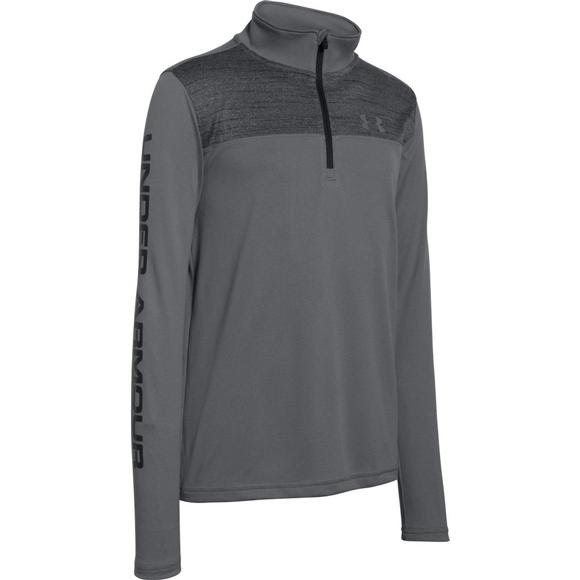 UA Tech material delivers lightweight moisture wicking performance with a cotton-like feel. It&apos;s the ultimate replacement for your old cotton T.